Ryan went back to his real job this week. A real, hardworking-man’s job in the outdoors, facing all the elements…not belittling the job my husband does….man, a morning of sitting at my computer uploading recipes really makes me appreciate what HE does! My brains would fall out if I was a computer programmer! Anyway, Ryan went back to his job in forestry after working the Winter season at Manning Park Ski Resort. After working outdoors all day long, with the temperatures still so cold, I needed a hot meal on the table to greet Ryan when he came home from work; trouble is, now that I am not working, I don’t spend quite so much at the grocery store…I am sure Save On Foods stocks have dropped! After foraging in the freezer I found 3 chicken breasts that I could use to make a stew. Luckily I had just been to the produce shop and had heaps of fresh veg on hand! I think I looked in my Betty Crocker cookbook but didn’t find what I was looking for so I googled Chicken + Stew and chose the recipe on offer for Chicken Stew with Dumplings from my friends at Canadian Living. 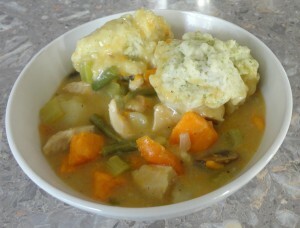 Chicken Stew with Dumplings simmering on the stove. In large pot bring water and chicken stock cubes to a boil. Add chicken; cover and simmer over medium-low heat for about 20 minutes. With slotted spoon, transfer to a medium size mixing bowl. Add carrots, potatoes and sweet potatoes to stock; cover and cook for 10 minutes. With slotted spoon, remove potatoes and sweet potatoes to bowl holding chicken. Pour stock into a large measuring cup, adding water to make 5 cups (1.25litres); set aside. In same pot, melt butter over medium-high heat and cook celery, onion and ‘shrooms, stirring often, until softened, about 8 minutes. Add flour, thyme, salt and pepper; cook stirring for 1 minute. Gradually whisk in reserved stock; bring to a boil, stirring. Reduce heat to medium-low; simmer, stirring often, for about 5 minutes or until thick enough to coat back of spoon. Return chicken, carrots, potatoes and sweet potatoes, and any accumulated juices to pot. Stir in frozen peas and whipping cream, to combine. In bowl, whisk together flour, baking powder, parsley, salt. Using a pastry blender cut in butter – or you can just rub butter in with your hands until mixture resembles coarse crumbs. Using a fork, stir in enough milk to make a sticky dough. Leaving space around each, drop by Tablespoonfuls (15ml) – I use a #3 Scoop – onto simmering stew. 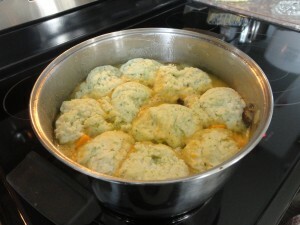 Cover and cook, without lifting lid, for 15 minutes, or until dumplings are no longer doughy underneath. I don’t drink alcohol but I do like to use some in baking now and again. You will regularly find Rum, preferably Bundaberg Rum, but seeing how it is from Australia it is not always readily available here in British Columbia. I will settle for Havana Club but prefer Captain Morgan’s Spiced Rum…afterall, I am baking with it! I also stock Cherry Brandy for making Black Forest Cakes. I WOULD keep Bailey’s Irish Creme in the pantry but somehow I think it would disappear! Case in point, when I brought the Bailey’s home the first thing on tap was an Irish Coffee for my husband! 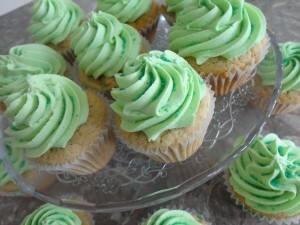 This recipe for Baileys Irish Cream Cupcakes came through my Facebook feed from Easy Baked. I didn’t follow her recipe to the T but was still happy with the results. I didn’t used Berry Sugar or Fine Sugar…just used what I had in the pantry. I didn’t use Cake Flour; used regular All Purpose Flour and used a whisk to combine the flour, baking powder, cinnamon and salt. Shocker, I am out of Vanilla so I used some Dr. Oetker’s Original Vanilla Sugar instead. (I am NEVER out of Vanilla but I am in the end stages of making my own Vanilla!) I omitted dousing the baked cupcakes with Bailey’s because I live in a house of peeps who prefer not to drink alcohol; I thought the Bailey’s might be a bit overpowering for them. I used my own Buttercream Icing subbing in Bailey’s for milk. Skipped the ganache altogether. Without further ado, Bailey’s Irish Creme Cupcakes. Line Muffin tins with paper liners – I only got 18 cupcakes. In a medium mixing bowl combine flour, baking powder, cinnamon and salt. Whisk for a few minutes. In mixing bowl cream butter and sugar together. Add vanilla powder and beat for 2 minutes, scraping sides of bowl as needed. Add flour mixture in 3 additions, alternating with Bailey’s, starting and finishing with flour. Beat for another 2 minutes, scraping sides as needed. Bake in preheated oven for 18 – 24 minutes, or until cupcake springs bake when touched or until pick comes out clean when inserted in centre of cupcake. Remove from oven to wire rack to cool in pan for 10 minutes. Turn out onto wire racks to cool completely before frosting. In mixing bowl combine butter and shortening; beat until smooth and light in colour. Add icing sugar, 1 cup at a time, stirring well after each addition. Stir in 2 Tablespoons of Bailey’s, increase mixer speed and beat for 30 seconds. Add more Bailey’s if needed, continue beating; when you achieve the consistency you desire, beat for 3 – 4 minutes until light and fluffy. I have recently rediscovered my bread maker. Great, a loss of more valuable real estate on the counter! But so worth it. I can’t honestly remember the last time I regularly bought bread at the shops. 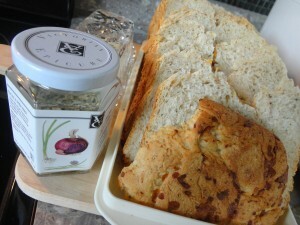 Home made bread, whether you do it completely from scratch or with the assistance of a bread maker…just so yummilicious! The house smells good, the bread is good – even if it doesn’t come out just right- oh, yes, the taste of freshly baked bread, straight out of the oven with a bit of butter or good olive oil. 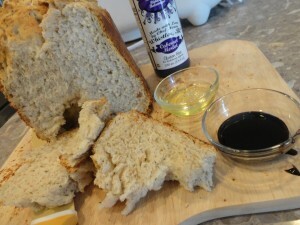 I have to admit that I love a slice of homemade white bread; it’s like you have died and gone to foodie heaven. It’s what childhood should taste like. White, pure, absolutely delicious. Maybe that is why I love it so much; it symbolizes what I miss, what I hope I gave my children and what I hope to give to my grandchildren. 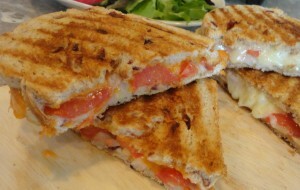 I digress, while I do love white bread and all it has to offer, I also love a fresh-outta-the-oven slice of whole wheat goodness! It is more sensible, right? Now the cookbook that came with my bread maker was sadly lacking in everyday recipes…who makes Potato Bread on a regular basis? Or Banana Bread…in a bread maker?? So I sat down at the computer and googled whole wheat bread; I settled on this one from my trusted friends over at Betty Crocker <-she taught me how to cook, bless her soul! I chose this recipe for Whole Wheat Cranberry Bread but have changed it up a few times: once I used Epicures 3 Onion Dip mix and Parmesan Cheese, another time I used Garlic and Italian Herbs…subbing out the Cinnamon and Cranberries, of course. So far they have all been a hit! Carefully measure all ingredients into the bread pan, in the order listed, except for cranberries – I often use the a bit of this a bit of that regime for making recipes but never for bread! It wants precision. Use Medium or Light Crust colour. Do NOT use delay cycle – Dough cycle is alright. Add Cranberries when the machine beeps. Remove baked bread from pan and cool on cooling rack. Omit Cinnamon, Nutmeg and Cranberries. Measure water, butter and honey into baking pan. Carefully stir herbs and garlic into the flour without disturbing underlying water. Sprinkle Yeast over combined flour mixture. 1/4 cup Parmesan Cheese, grated – when the machine beeps.Carefully stir herbs and garlic into the flour without disturbing underlying water. When machine beeps, add Parmesan Cheese. St. Patrick’s Day has come and gone for another year. 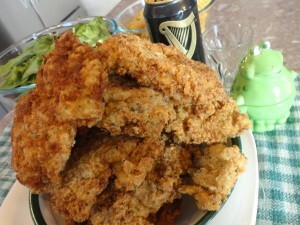 This year instead of the obligatory Shamrock Sugar Cookies with Green Icing I made Guinness Fried Chicken! And Bailey’s Irish Creme Cupcakes with Bailey’s Irish Creme Buttercream Frosting; I can’t vouch for the chicken but the cupcakes were splendid! I used to see a lot of recipes containing Guinness but never tried any of them before now. Too bad because when we lived in Australia my dear husband often bought Guinness and would have regularly had some on hand; for this recipe I had to go to the Bottle Shop specifically to pick up a single can of Guinness. All good, whilst there I spotted the display for Bailey’s Irish Creme which inspired me to make the cupcakes. 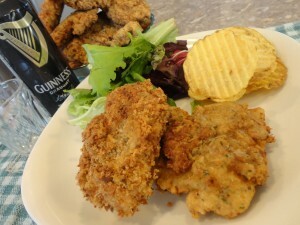 Anyway, I googled Guinness + Chicken and chose this offering from globalfoodfusion . Specifically speaking, I came up with Ursula’s interesting tale; how to ogle handsome firemen and make great tasting chicken! I made a few changes to her recipe simply because I used what I had on hand but feel free to head over to her recipe for Guinness Fried Chicken …who knows, maybe using her recipe will garner you an audience with handsome firemen too. I grilled husband and son about the chicken; they were happy with the crunch factor, flavour – good. That’s as good as it gets around here. The lil grandson loved it, too; getting a finicky toddler to eat much of anything is always a victory! Pound chicken thighs to 1/4″ thickness. Pour Oil into a large (30cm) deep skillet; do not turn on yet. Place a wire rack on a baking tray covered with L-Foil, for easy clean up; set aside. In a large, shallow mixing bowl whisk together flour, herbs and spices. Lightly beat eggs; add eggs and Guinness to flour mixture and stir with whisk until no lumps remain. In large, shallow mixing bowl combine flour, breadcrumbs, Italian seasoning, basil, salt & pepper and parsley. Turn oil on to Medium-High to heat while breading the chicken.Lightly coat a piece of chicken in the breadcrumb mixture. Dip into batter, allow some of the batter to drip off. Return chicken to breadcrumb mixture and coat again. Repeat with each piece of chicken. Place two or three pieces of prepared chicken into the hot oil. Using long handled tongs, turn over and continue cooking for another 3 – 5 minutes, until golden brown and crispy. Lift chicken out of oil and let drip for a few seconds. Place cooked chicken on prepared wire rack to drain off excess oil.